The area was first developed in the 1840s. In 1906, the Texas Railroad was extended from Rusk to Palestine. Camp Wright, a branch prison, was established at the Maydelle site to house prisoners assigned to cutting wood for charcoal for the prison foundry at Rusk. In 1910, C.D. Jarrarr and N.A. Slover purchased several hundred acres around the camp and platted the town of Maydelle. They named the town in honor of the daughter of Governor Thomas Campbell who was instrumental in getting the Texas legislature to approve the extension of the line. Businesses and residents from the surrounding communities of Gent, Java, Mount Comfort, and Pine Town had moved to Maydelle to be closer to the railroad. By 1914 the town had two churches, four general stores, a bank, a cotton gin, a drugstore, and approximately 150 residents. The town’s population peaked at 450 in 1929. The population has remained around 250 since the early 1990s. The Texas State Railroad has a depot in Maydelle. Maydelle is located east of the Neches River at the intersection of U.S. 84 and FM 2138, 9.5 miles west of Rusk, 21 miles northwest of Alto and the Caddoan Mounds SHS, 41 miles northeast of Grapeland via Palestine, 21 miles northeast of Palestine, 13 miles east of the I.D. Fairfield Texas State Forest, 23 miles southeast of Frankston and Lake Palestine, approximately 6 miles south of Lake Jacksonville, 12.6 miles south of Jacksonville, and 46 miles southwest of Henderson, Texas. “Maydelle In 1906, the Texas State Railroad built to this area for timber to fuel iron manufacturing at the penitentiary in Rusk. The branch prison established at the railhead was called Camp Wright. When Rusk native Thomas Campbell became governor, he persuaded the legislature to extend the line to Palestine, where it met the I&GN railway. The line brought new settlement to the Camp Wright area, and in 1910, residents platted the new town of Maydelle, named for the governor's daughter, who sang at the town site's dedication. The town was an early center for cotton, timber and tomato production, but its population, like in other rural Texas towns, declined by the latter part of the 20th century.” The marker is located on U.S. 84, in front of Texas State Railroad depot. “In operation from 1908 to 1912, the Mewshaw State Sawmill at this site produced 35,000 board feet of lumber daily and was staffed by convict laborers form the nearby Rusk State Penitentiary. The village of Maydelle later developed on the rail line that ran between Rusk and Palestine, and in 1933 a forest conservation camp under the auspices of the Federal Civilian Conservation Corps (CCC) was established here. The camp was closed in 1937, but the benefits of its programs are still evident in the I. D. Fairchild State Forest, now a wildlife sanctuary.” The marker is located at the corner of U.S. 84 and FM 747, 4 miles west of Maydelle. Due to budget constraints, TX-DOT no longer maintains a website offering spring wildflower sightings. Information is available at the magazine. The months of April through October are the worst months for mosquitoes. Rub yourself with Bounce Fabric Softener sheets, or with Vicks Vapor Rub or pure Mexican Vanilla. Some swear taking a daily vitamin B-1 pill works to repel mosquitoes. Mosquitoes love you when you eat bananas. Mosquitoes are also attracted to some perfumes, including perfumed shampoos. Planting Marigolds in your yard repels mosquitoes. On a picnic table try covering the bottom of a white plate with “lemon fresh” dish wash soap, or use citronella candles. Home Depot sometimes sells the candles in small metal buckets. The ThermaCell Mosquito Repellant is also quite effective in ridding small outdoor areas of mosquitos. Dynatrap Company makes a large standing electric mosquito machine that works like electric bug zappers. It is very successful at making large areas mosquito free. When purchasing mosquito repellent buy those with the ingredient N, N-diethyl-M-toluamide. The fine net clothing available from Cabela’s and other sporting goods stores is highly effective in preventing mosquito bites. In the late 1800s, the Texas Prison System established the East Texas Penitentiary in Rusk, Texas. A foundry was constructed on the prison grounds in 1884 to convert the area's rich iron ore to cast iron using prison labor and charcoal made from native timber. By 1886, it became apparent that transporting the timber and iron ore by horse and wagon was impractical so 5 miles of railroad track was built. The line originated at the prison in Rusk. By 1906, it was extended to the Cotton Belt Railroad track in Rusk, and to the International and Great Northern Railroad track in Palestine. In 1921, the railroad ceased operations, the rolling stock was sold, and the line was offered for lease. Between 1921 and 1960, the Texas & New Orleans Railroad operated the line. When the TPWD took over the line from T.S.E. in 1972, the line was in poor condition. Rusk prison labor was used to clear the overgrowth of brush, replace cross ties, and repair the railroad bridges. TPWD employees traveled around the country in search of vintage cars and steam locomotives. Victorian style depots were built in Rusk and Palestine. The park opened to the public in 1976, transporting passengers the 25 miles between the two stations, and becoming East Texas' most popular tourist attraction. By 2006, the annual costs to maintain and operate the railroad were $1,000,000 above the annual revenue generated by the railroad. In 2007, the legislature passed Senate Bill 1659 allowing for the creation of an operating authority with the power to lease the system to a private operator. The railroad was transferred to the Texas State Railroad Authority and leased for operations by American Heritage Railway. Train depots are located in Maydelle, Rusk, and Palestine, Texas.Camping and train ride fees apply. 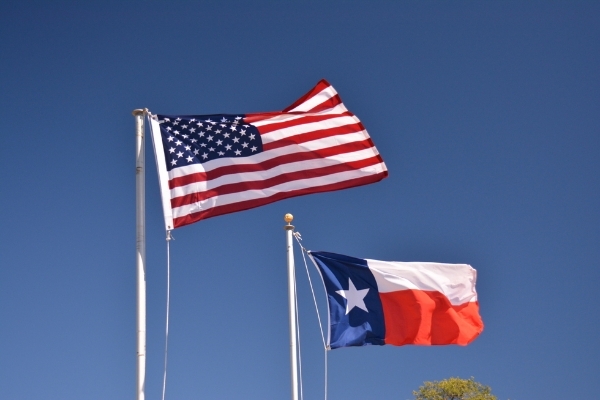 For more information, read the Park Brochure and go to the Texas State Railroad Park Home Page. This 93.8 acre park was the most western ceremonial site of the Mound Builders of Caddoan who lived here from approximately 800 A.D. to 1300 A.D. They supported themselves by fishing in the nearby Neches River, and by hunting and farming. Remaining remnants of their culture include two temple mounds (a low temple mound, and a high temple Ceremonial mound), a burial mound, and a large portion of the Mound Builders' village. The mounds are located on the historic El Camino Real de los Tejas National Historic Trail. A 0.7 mile self-guided interpretive loop trail meanders through the site; a short branch trail leads to the borrow pit. A 1.5 hour guided tour is available. Group tours are available by appointment. Facilities include a picnic area, and the visitor center and gift shop featuring an interpretive center and restrooms. The Caddoan Mounds Site is wheelchair accessible. Texas Historical Markers are located at the High Temple Ceremonial Mound on SH 21, and on CR 2907 (Weeping Mary Road) at the Zebulon Pike Campsite. This SHS hosts special programs and events, and group tours by appointment. For more information read the Park Brochure, view the Facilities Map, and go to the Caddoan Mounds SHS Home Page. Caddoan Mounds is located 6 miles southwest of Alto, Texas, on SH 21. 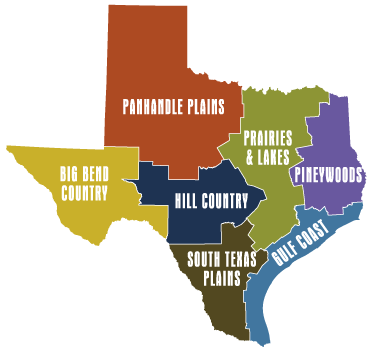 The 2,740 acre Fairfield State Forest was acquired in 1925 from the Texas Prison System. It was named after Senator Fairchild of Lufkin. The small day use area in the main tract has a fishing pond and picnic tables. There are no restrooms. There are eleven miles of trails. Activities in this area include biking, hiking, horseback riding, and birding and picnicking. All horses must have proof of a recent negative Coggins test. This area is located 0.25 miles south of U.S. 84. Special forest attractions include a historical fire tower, and the Red Cockaded Woodpecker (RCW) Management Area. Forest management demonstration areas and sites exist throughout the forest. The forest service hosts group resource education tours by appointment. Visitor resources include the facilities & trails map and trails topography map. The forestis open year round during daylight hours. (903) 729-7738. Information and maps are available at the Palestine District Office at 2203 West Spring Street (U.S. 287), Palestine, Texas. The forest is located13 miles west of Maydelle, Texas on U.S. 84.